Whether your denture is chipped, fractured, broken in half or completely in pieces- we can help! Send all pieces that you can find to us and if it’s possible to repair, we’ll repair it quickly and professionally. If your denture is unrepairable, we’ll let you know too so that you can make plans for new ones at your local dental office. 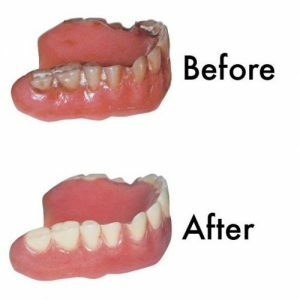 We are the answer for any denture problems you have and if your dentures can be repaired, we can do it quickly and professionally. Call or email us today if you have questions.